Spring is the perfect time for a shower. Whether it is baby, engagement or wedding, this is the perfect time of year to come together and celebrate! KF recently threw a shower with other friends and hostesses for her son Harrison’s first grade teacher. Never one to pass up the opportunity to celebrate such a sweet occasion, Kathy knows a thing or two about how to entertain with style. From food, to decor and more, we have the tips to throw a stunning spring shower that your guests will undoubtedly enjoy and with great planning, you can enjoy just as much. One of the key aspects of party planning is planning ahead and being prepared so you can enjoy and entertain with grace and style at your event. 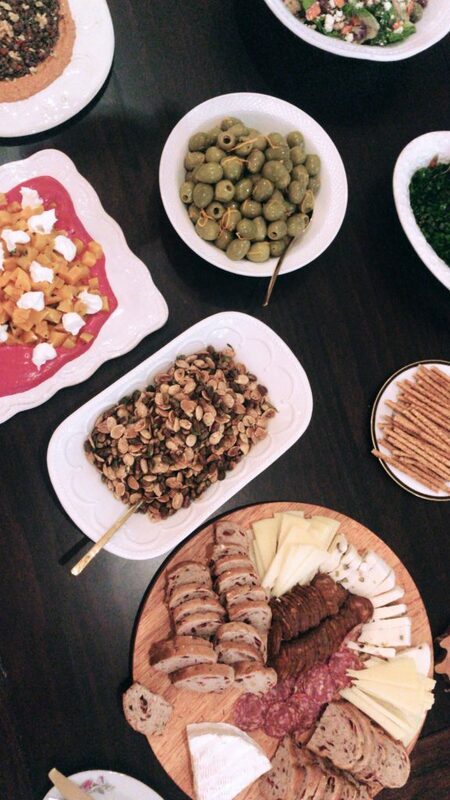 One of the keys to great traffic control during any party is providing clear and obvious areas dedicated to food, drinks, where to place gifts, etc. KF turned her dining room into the perfect buffet style food station. 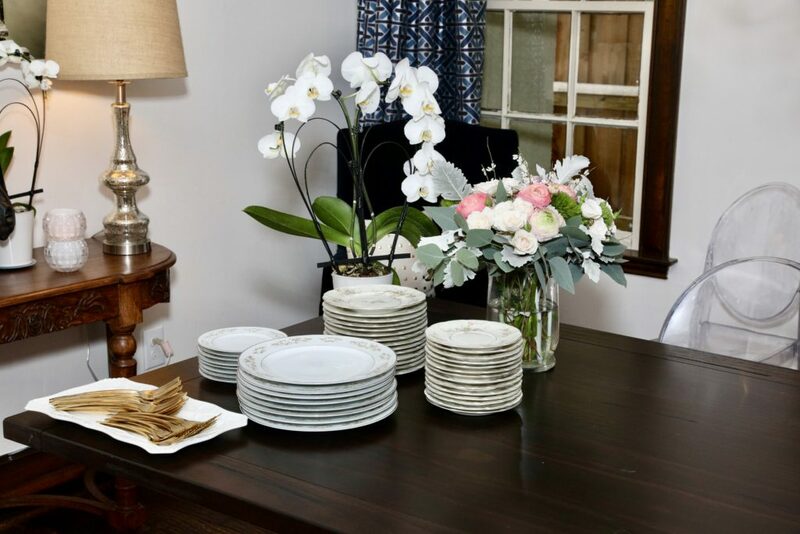 Kathy set the theme by using different and mismatched sets of grandmothers’ china, which created a beautiful accent to such a sweet theme, and new gold flatware was an added and chic touch. 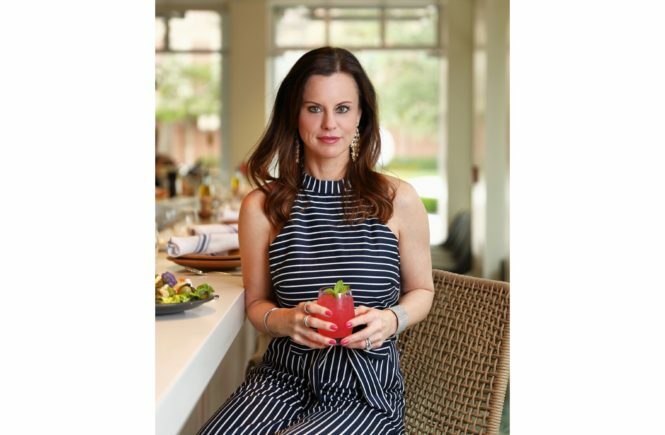 KF Tip ~ Any occasion seems that much more special with crystal glassware, unique dishware, and real flatware. It makes a special statement and elevates any party to the next level of graciousness and style. Having sweet treats that are easy to grab and go with personalized monogramming, what could be more adorable and thoughtful? 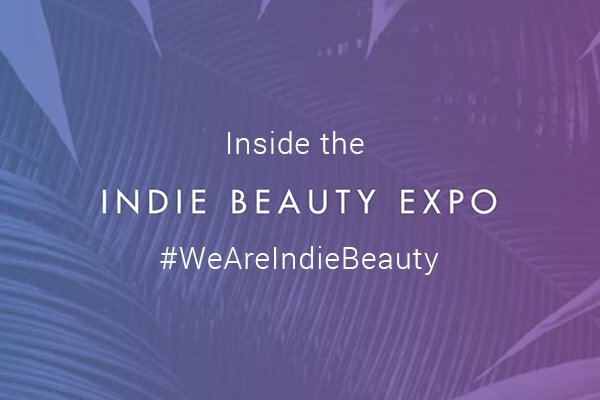 These custom macarons from We The Birds were a lovely idea by hostess Brooke Craken, and a fabulous and personal touch that did not go unnoticed! 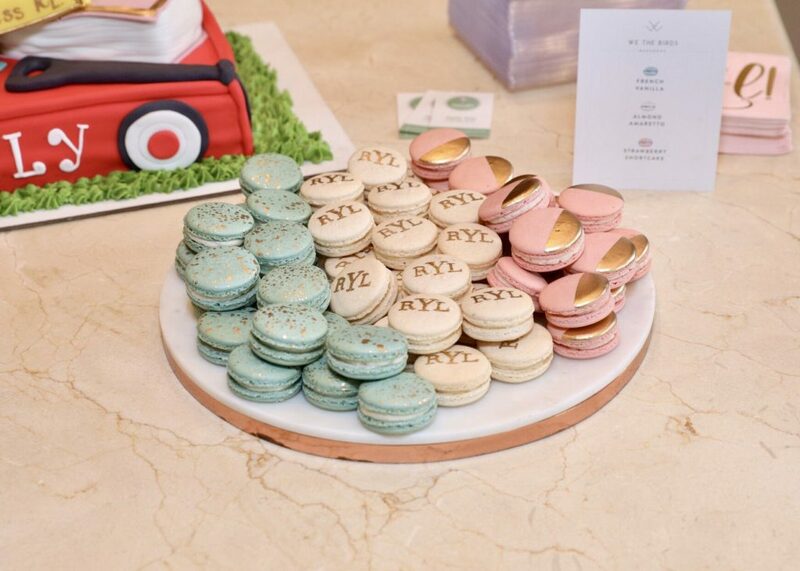 The great thing about macarons is you can choose them to coordinate with your color scheme, and include future baby’s monogram (if it’s already known) or the happy couple’s initials accented in metallics, which makes them the perfect little delight for any party. 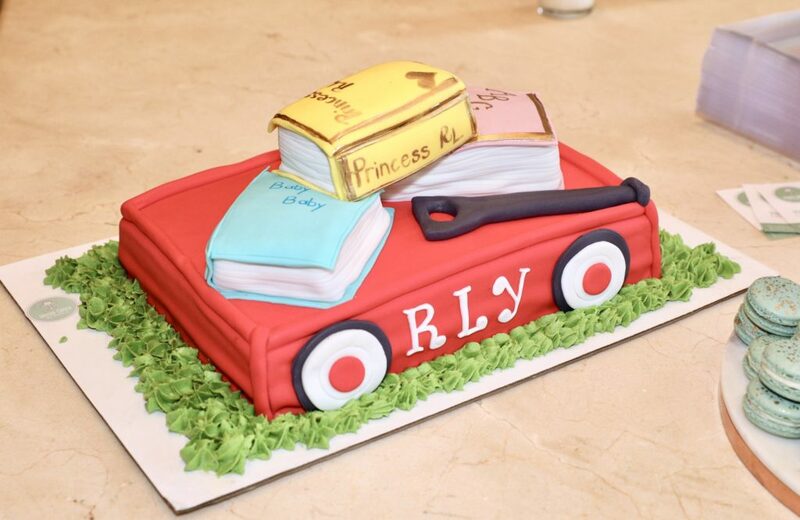 And the cake? Always a fun way to make a statement or accentuate a part of the shower, this one from Unique Cakes by Paola was a perfectly beautiful addition! Kathy and the other hostesses chose to add a request of guests attending to bring a book (either a new or one from their own library that kids have outgrown) as a gift for the mom to be. Helping a new mom build her library for nighttime story time is a gift that lasts a lifetime and beyond. The food was a lovely mix of yummy Mediterranean food from one of KF’s local faves, Sachet. A charcuterie board, greek salad, hummus, lentils, beets, and more was delightful and simply delicious. Finding unique dishes that are beautiful to look at as well is a key aspect of creating a beautiful party. 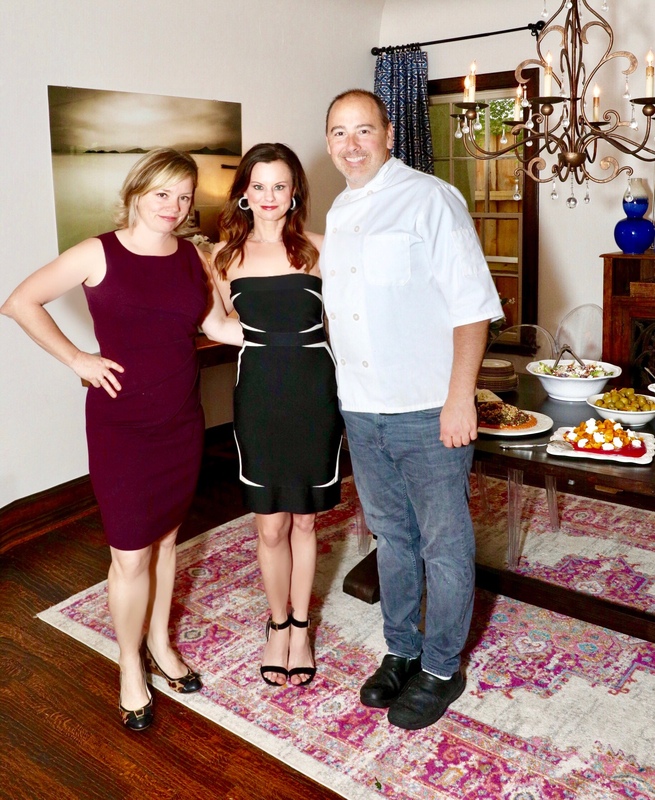 Friends and owners of Sachet, head chef Stephen Rogers, and his wife and co-owner, Allison Yoder paid a special visit to prepare the food in Kathy’s kitchen and personally plate it, which was an added and lovely surprise. Decorations are what draws your guests in and creates the ambience of the shower. 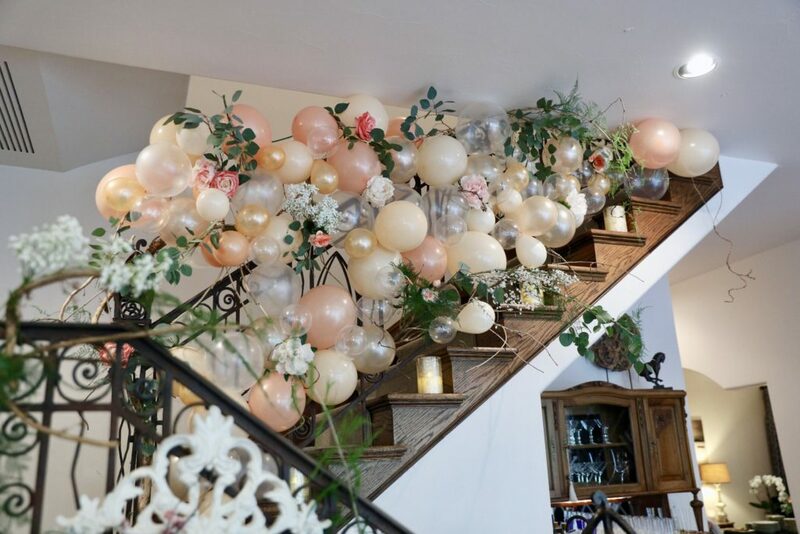 This stunning photo op wall was created by Crystal Brinkley of Loops and Swirls, Kathy’s friend and one of her fellow hostesses, along with another hostess Yvonne who assisted with the installation. The effect was perfection, and guests were delighted with such a whimsical and beautiful presentation. 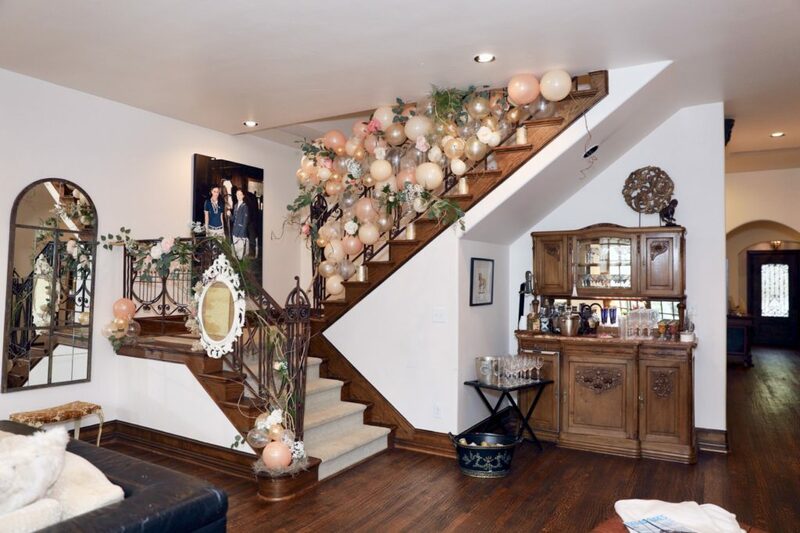 KF Tip ~ A great way to invite guests and make them feel at home is to include a balloon installation like this one or some sort of feature at the entrance of your home. A wonderful way to let guests know where to find you, as well as to invite party-goers in with a most whimsical and eye-catching feature that sets the mood for a wonderful gathering. 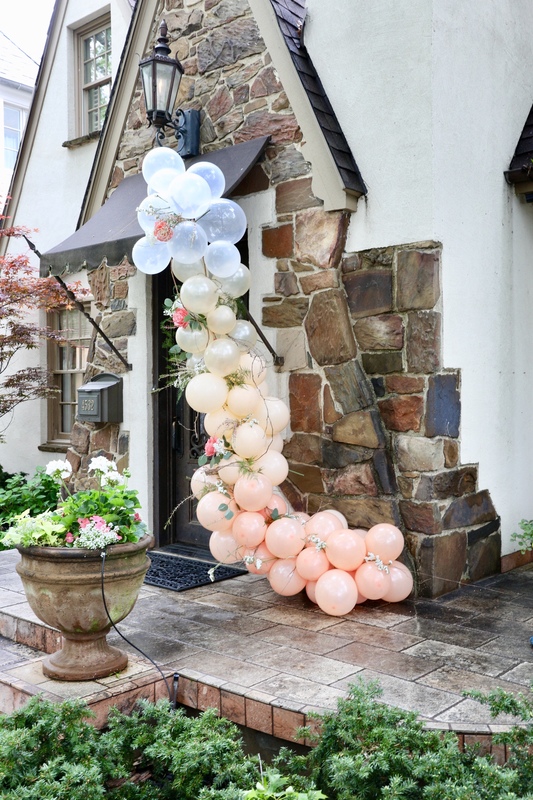 Perfect for picture opportunities, soft peach, pink, and clear balloons accented with greenery and flowers and made for a stunning entrance and vibe. 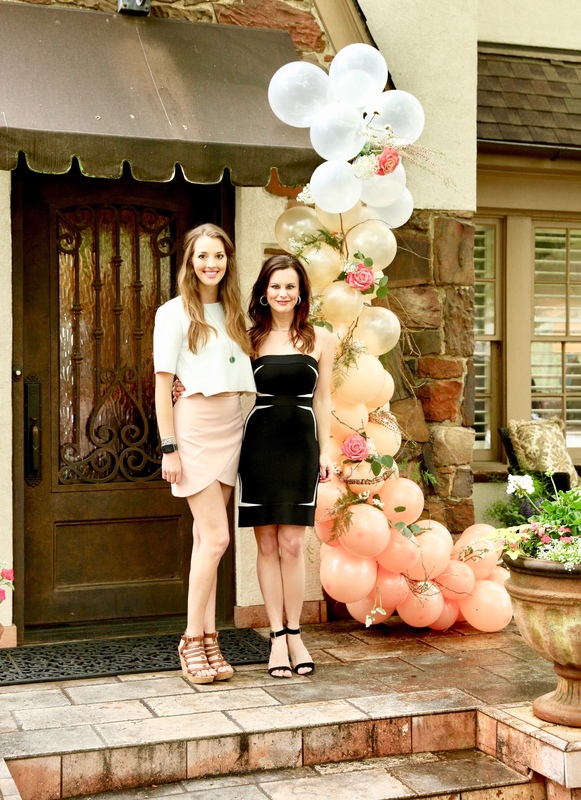 KF Tip ~ The structure of the balloons was actually created from branches trimmed from trees in Kathy’s yard. They made the perfect abstract backdrop to create such a whimsical and natural feel. Adding in greenery, fresh flowers and some silk ones as well, finished off this feminine and flirty art installation. The key when decorating for any shower or party is making sure there is cohesion and functionality in your design. Pulling together a cohesive theme is easily achieved by repeating the same floral and decorative motifs throughout, and the bonus is it looks beautiful throughout the venue and feels as if it’s been professionally designed. We recommend having a portion of the event blocked out for games (if you are playing them), entertainment, or opening gifts. It’s so much fun to see what the new mom and baby receive, and all the guests are delighted to see the guests of honor’s reaction as well. It’s important to plan out the designated gift opening space ahead of time so that guests don’t miss the opening and also have a place to sit comfortably as they watch and enjoy. Planning all of this ahead of time with hostesses and designating stations and assignments assures everyone has a wonderful time. 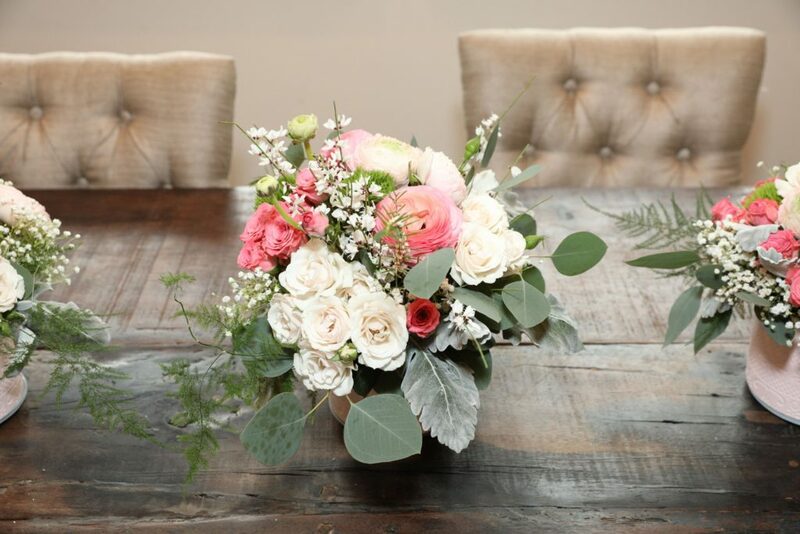 Flower arrangements that follow the theme throughout your home tie everything together. Floral is an important touch for any shower, and it’s one of the easiest ways to make a cohesive theme and carry it out throughout your home from the powder bath to the living room and beyond. 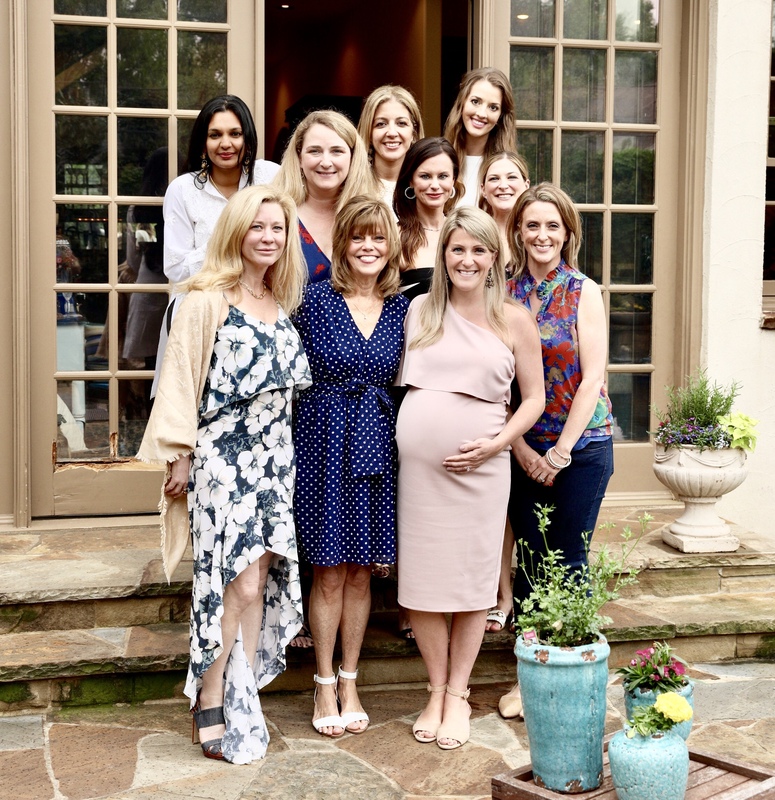 KF with the guest of honor, mom to be Lindsey Young. 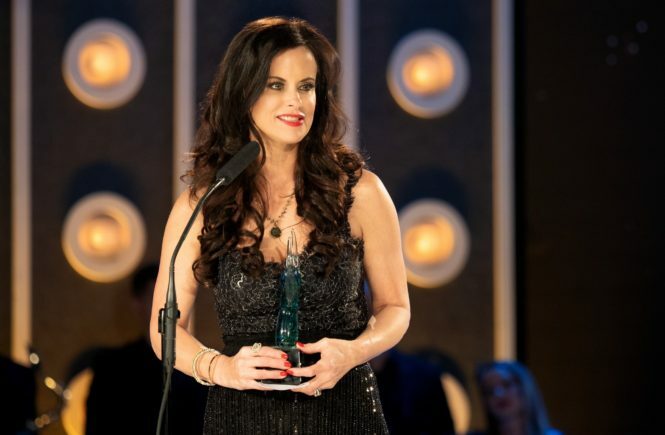 You can’t forget the party favor at any great party!! 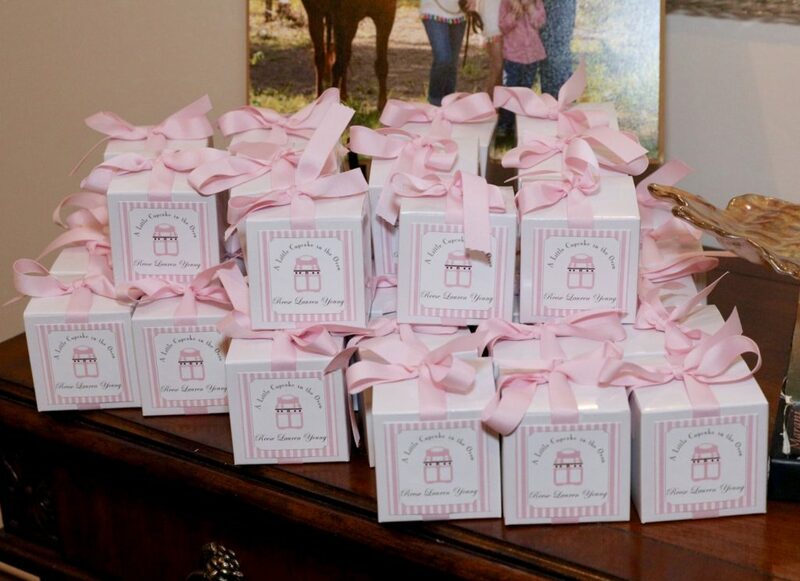 Adorable little boxed cupcakes allowed guests in attendance to have the perfect token of appreciation to remind them of a lovely afternoon. 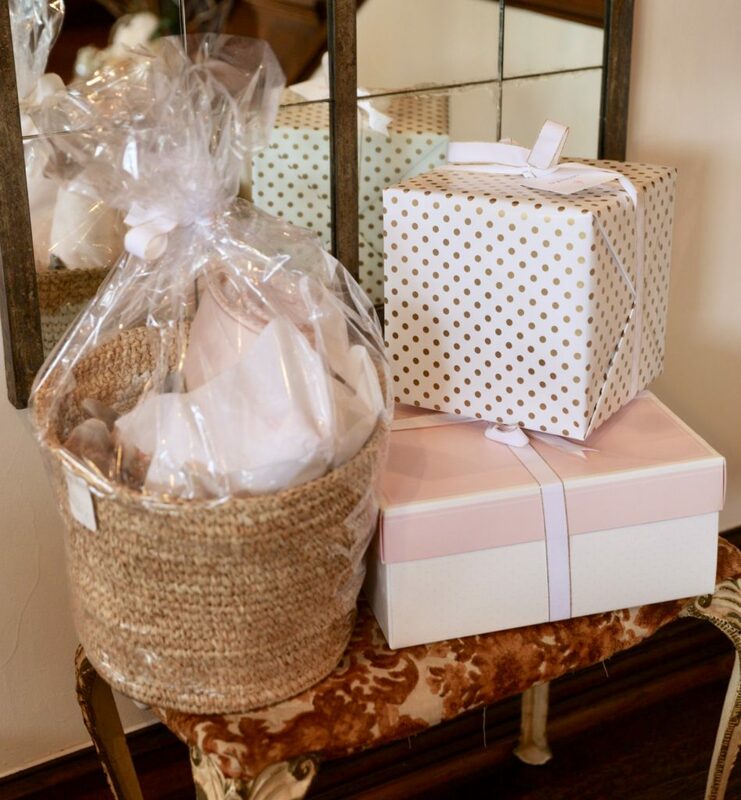 The perfect finishing touch added by hostess Katherine to a beautiful baby shower.